The best RV service in Ohio... GUARANTEED! If you live in Ohio and are looking for an RV, the RV Wholesalers Buckeye Service Guarantee gives you the absolute best service you can get for no additional cost! 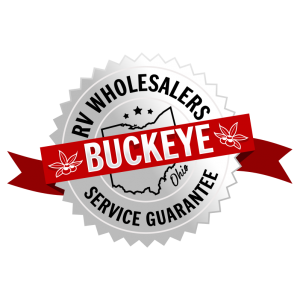 Attention all Ohio residents: we’re excited to announce the New RV Wholesalers Buckeye Service Guarantee for all our Ohio customers! We’ll expedite service for you no matter where you live, camp or travel in the state of Ohio. Our nationwide service network takes care of your service needs through our network nationwide but while in Ohio, your service needs will be handled directly through us whenever possible and handled with priority order. If a repair would keep you from camping, we’ll provide a loaner RV for you to use so your trip isn’t ruined. You’ll also get a 10% discount on all parts/accessories at our Ohio store and online storefront. You’ll have access to an Ohio resident only dedicated phone number for service and questions. Free shipping! Yes that’s right both on parts and RV’s anywhere in Ohio, we’ll deliver them right to your door for free if need be. And finally you’ll get the winterizations for $45…almost 20% off at our Ohio location! Service no matter where you live, camp or travel in the state of Ohio. You'll get a loaner RV if you ever have an issue that would prevent you from camping. Get FREE shipping on all parts AND any RV you purchase! Receive our 10% Ohio resident only discounts online and in our store. Access to our dedicated service phone number for Ohio residents only. At RV Wholesalers we pride ourselves in taking care of customers long after the sale. We have literally transformed an entire industry by doing so like no one else. With things like our RVW Bill Pay and Concierge Service and of course our Nationwide Service Network, we take care of our customers and always have. And since we're located in Ohio, the Buckeye Service Guarantee now allows us to take even better care of our fellow Buckeyes who live in the great state of Ohio! No one else even comes close to this level of service in Ohio. Yes that's right, all of your parts and even your RV will be shipped to your door for free anywhere in Ohio! Who else is going to provide you with a loaner RV if a service need arises that would prevent you from camping? No one...that's who! We provide all of our Ohio customers with a dedicated phone number for support, service and any questions they have. Just one more way we're serving you better! If, for any reason, you have any issues with your RV, no matter where you live, camp or travel in Ohio, you'll receive expedited service, a loaner rv if the repair will keep you from camping, free shipping on parts and rvs anywhere in Ohio, a 10% discount on parts and a dedicated service # for help or questions. You'll also get almost 20% off on our winterizations at our Ohio store. Get the best deal and support on your next RV today! Click the button below to have a look at our massive inventory and rock bottom prices knowing you'll get the best post-sale support in the country. And if you have any questions or need any help with anything, don't hesitate to call us at: 877-877-4494 so we can help you find your next RV today!